I want to be able to adjust my thermostat(via Jay's Advance Thermostat Script) when none of my 4 devices are home (or have left the geofence). You have that part covered. But as soon as one of them re-enters the geofence, I want to be able to readjust the he thermostat accordingly using the variables. I haven’t set up any triggers within the plugin - but can, have in others — but I am always a bit lost as to triggers versus state changes being the best way to trigger activity. 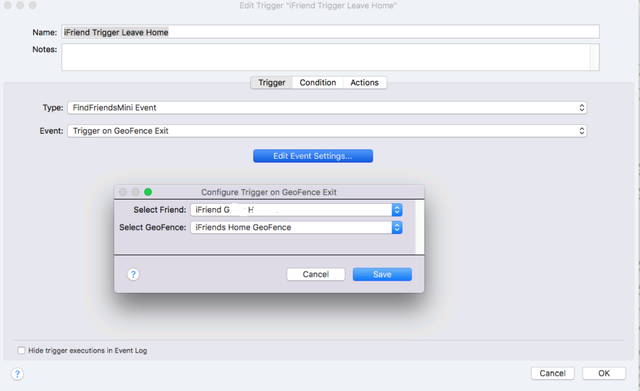 But here it probably makes sense and can have a look a enter, exit trigger options for each iFriend. I have been put off by the obvious time delay involved. Have been making some moderate upgrades including, add travel time to Geofence and total distance to Geofence - using google api matrix. Have finished that now (for Geofence Named home and 2nd named other) so will look at triggers shortly. Meanwhile, I would think that could do a trigger on numberoffriends within Geofence. Eg. >0 ? Or equals 1. Issue with this is it may trigger again when goes from 1to 2, to 3 etc but presumably that isn’t big issue. As to immediate location update - as mentioned I use iBeacon plugin and geofency apple iOS app. Set up web hook and immediately triggers arrivals. I believe Geofency also hooks into WiFi on phone (recognizes network) and GPS, so if WiFi connects the immediately updates and recognizes where it is. Is very quick, so quick can open garage door and turn lights on with. See Version 0.4.5 to address this and more. Thanks Glenn! Appreciate all of your work and support.